Back in August, the Crystal Ball took a comprehensive look 2 at the Virginia House of Delegates districts that could potentially be competitive on Nov. 5. With Election Day in Virginia just five days away, it seems like an appropriate time to provide a short update. To refresh, there is still no chance that Democrats will win a majority of the chamber's 100 seats. Republicans presently hold a 68-32 edge (counting one independent caucusing with the GOP), giving them an impregnable advantage in the House. Even more helpful to Republicans is the fact that the only sure-fire pick-up in the House is going to be a Republican one in HD-4, an ancestrally Democratic district in southwest Virginia currently held by retiring Del. Joe Johnson (D). The GOP is the only party fielding a candidate there. However, as it has become increasingly apparent that ex-DNC chairman Terry McAuliffe (D) is going to win the governorship, the final result in the House of Delegates will probably depend on McAuliffe's margin of victory on Election Night. With essentially no public polling to rely on in these districts, most analysis has to come from conversations with both sides. And both sides are saying this: margin matters. Based on HuffPost Pollster's tracking model 3, McAuliffe has a roughly eight-point lead at the moment. If that grows further, as perhaps indicated by the latest poll 4 from The Washington Post (where McAuliffe was leading by 12 points), there are some marginal seats that Republicans may have a difficult time hanging onto. If McAuliffe's lead contracts -- as indicated by a Wednesday Quinnipiac poll 5 that showed him only leading by four -- Republicans could limit Democratic gains. As it stands, there are 12 Republican-held seats that could reasonably be considered in play on Nov. 5 (not counting the aforementioned GOP pick-up in HD-4). Given the nature of these races, it's very hard to predict just where the McAuliffe-led Democratic wave may crest. It may be a very small breaker, carrying only one or two of these seats on election night. Or it could be a tidal wave, taking as many as seven or eight of them. Most interestingly, none of these races could be rated at least Leans Democratic, despite McAuliffe's lead and the fact that many of these districts have been relatively Democratic in recent presidential years. That is to say, there are no likely Democratic pick-ups even though the current atmosphere is favorable to Democrats. Instead, many of the seats listed above can be called Toss-ups, and it's hard to make an educated guess which way the coin flips will fall on Election Night. 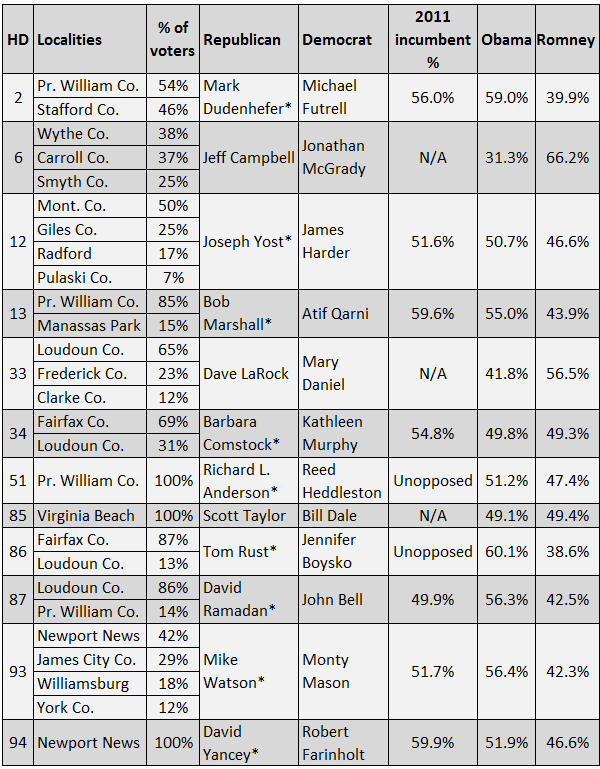 Of the many seats listed here, perhaps a good one to watch to get an early read on how the election is going is HD-93. Incumbent Del. Mike Watson (R) occupies a 56% Obama district that he narrowly won in 2011, defeating a one-term incumbent. If the early returns indicate Watson is positioned to possibly survive, it may signal that House Republicans are, for the most part, holding their ground around the state. But if those early returns show Watson in trouble, it might be a sign Democrats are positioned to win a number of seats. Overall, to borrow gambling parlance, the over/under for the House of Delegates battle should probably be set at a Democratic net gain of 3.5 seats. Republicans will take the under, Democrats the over.